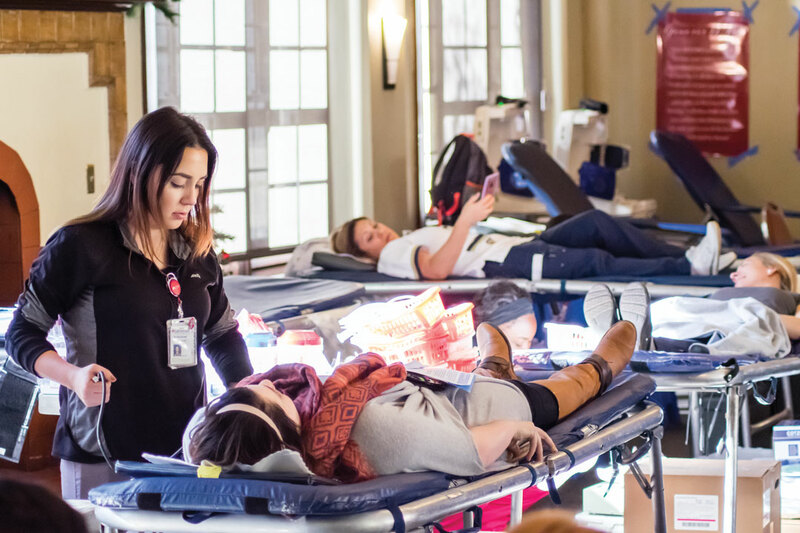 The California Baptist University Office of Mobilization held its annual blood drive Nov. 29-30. The drive is set up every year to raise funds for International Service Projects. The Staples Room was turned into a blood drive center as students stepped up to donate. Blue beds became home to those having their blood drawn as professionals monitored them carefully. Others who had already completed the process stuck around to eat snacks and chat with some of their peers. Every pint of blood donated $15. Upon checking in, students could designate to which team they wanted to donate, or they could have their donation divided between all the teams. Scott Liddell, a graduate assistant for the Office of Mobilization, said the blood drive not only aids in raising funds for ISP trips but also does something good locally, as well. ISP teams often host fundraisers for their trips, but a blood drive is different on the level of active involvement from supporters. Some students showed up to donate for the first time in support of classmates or friends. Others came for the purpose of giving blood. Even those students who could not donate themselves encouraged others to do so. Cynthia Salinas, freshman pre-nursing major, will be going on an ISP trip and attended the blood drive in support of her team and others. “I know there are a lot of people who can learn from the word so I just want to help people,” Salinas said.